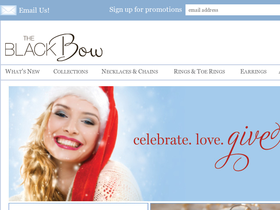 Shop The Black Bow online at TheBlackBow.com for all your jewelry needs, wants and gifts. The Black Bow carries collections of angels, baroque artisan pearls, cancer awareness items, colored pearls, Disney, Ed Hardy, expression bracelets, first light, friends & family, initials, inspirational items, isle of shoals, keys, live, love, laugh items, lotus collection, memorial items, natural stone items, NFL, northern lights, open wings & religious items. Save on your next purchase from TheBlackBow.com with The Black Bow discounts, The Black Bow coupons and The Black Bow savings from 58coupons.com. When you spend over $325 at TheBlackBow.com you will receive 20% off your entire purchase with this coupon code. Click code to start saving. Right now The Black Bow is offering 15% off your entire order with this coupon code. Click link now.